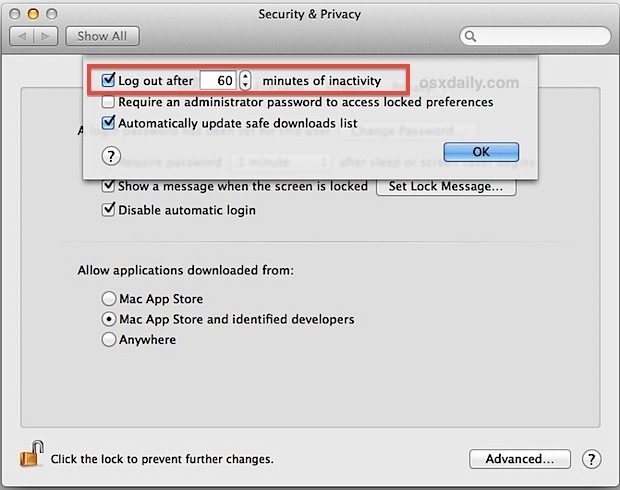 Using the automatic log out feature is a good way to bring an additional layer of security to a Mac. It works just as you’d expect; after a predetermined amount of time has passed without activity, the active user account logs itself out. This means all currently running apps close out as well as all documents which save in their current state through the Versions & Resume features. Then, in order to use the Mac again, someone will have to log back in with appropriate user and password credentials, thereby preventing unauthorized access. And of course because of the relatively new OSX Resume feature, once you do log in again all of your past apps and documents will launch again where you left off. As we’ll mention, this is best used in conjunction with the standard Mac lock screen trick that utilizes the screen saver and can be activated through a keystroke, and should not be considered a replacement for that unless the inactivity time is set very aggressively or there is some other unique circumstance. The default setting is 60 minutes, which is fairly generous but also allows for reasonable time to pass, like a lunch break or whatever else. While you’re in the Security & Privacy control panel, be sure to disable automatic login as well by unchecking it under the “General” tab. That way any user will be required to login with a user account with full credentials and a password – even if they reboot the computer – just remember to have the Guest account configured so that you will gain the Find My Mac protection offered through it in the odd event the computer is stolen,making it trackable from the web, another Mac, or iOS device that has Find My iPhoneinstalled. While this is a great security feature, using this alone should not be considered adequate for keeping your Mac safe from unwanted user access. For Macs that are in public,offices, schools, or elsewhere where others may gain access to the computer, you should always set the screen saver to activate with a password thereby locking down the Mac screen. The lock screen method in Mac OS X will then cover the shorter periods of inactivity of just a few moments away from a desk, and also remains a quick way you can manually activate the passworded screen by invoking an appropriate keyboard shortcut, while the more inclusive automatic log out will cover longer periods away from the desk. If you’re wondering what the difference of these two similar features are, here’s a brief explanation of each and how they’re different. 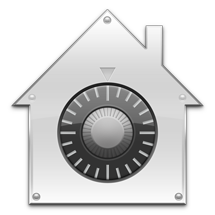 Automatic Log Out will close applications and documents of the logged in user, while saving the last state of OS X so that everything will resume back to where it was once the user is logged again. This frees up system resources for other users, and allows other users to log into the computer if it’s multi-use. Screen saver locks only bring a protective layer over current actions and don’t log anything out, all apps continue to run in the background and documents remain open. Because the user stays logged in, it does not free up resources by closing out apps of that user, and it also does not allow another user to login to the Mac. In short, the screen saver approach is perfect for quick away-from-keyboard moments, while the automatic log out is better for extended periods away from a desk, particularly in corporate or educational environments.